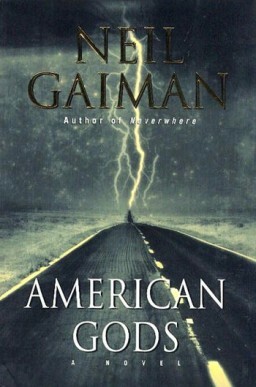 I would like to read American Gods by Neil Gaiman. It features a taciturn convict named Shadow who is released from prison early when his wife, Laura Moon, and best friend Robbie Burton die in a car accident, leaving him alone in the world. Bereaved, he takes a job as a bodyguard for a mysterious conman, Mr. Wednesday. Shadow and Wednesday travel across America visiting Wednesday’s unusual colleagues and acquaintances until Shadow learns that Wednesday is in fact an incarnation of Odin the All-Father. Wednesday is recruiting Old Gods of ancient mythology, to participate in an epic battle against the New American Gods – manifestations of modern life and technology, such as the Internet, media, and modern means of transport. Shadow meets many gods and magical creatures, including Mr. Nancy (Anansi), Czernobog, and a leprechaun named Mad Sweeney who gives Shadow a magical gold coin. However most of the Old Gods are reluctant to get involved in a fight with the New Gods. Then The New Gods abduct Shadow but Laura rescues him, Wednesday hides Shadow with a few stray Egyptian gods (Thoth, Anubis, Bast, Mr. Jacquel, and a common brown housecat) who run a funeral parlor in the tranquil town of Lakeside, Illinois. Shadow meets many other colorful locals in Lakeside including Hinzelmann, an old-timer who spins tall tales, and Chad Mulligan, the local chief of police. However Shadow suspects something is not quite right about the town. Which seems to prosper While neighbouring communities turn into ghost towns. children also disappear regularly . Shadow travels across America with Wednesday, whilst trying to avoid the Men in Black and meets Johnny Appleseed and Easter until the New Gods murder Wednesday. So The Old Gods rally behind a common banner to face their enemies in battle. In the afterlife Shadow meets Thoth and Anubis. Easter later brings him back to life. During his time between life and death, he discovers Mr. World is secretly Low-key (Loki) Lyesmith and that Odin and Loki have been causing trouble. Loki Used Odin’s murder to cause a battle between the New and Old Gods so that Loki would be able to feed on the chaos of the battle, So Shadow travels to Rock City, to try and stop the battle. Shadow then returns to Lakeside, and tries to discover the town’s secret, the reason for the missing children and Hinzelmann’s true identity . The book also features many other weird and wonderful characters including: The Queen of Sheba , the first Viking explorers and a Cornish woman who inadvertently populated America with pixies and fairies. The book has also been made into a Television series. 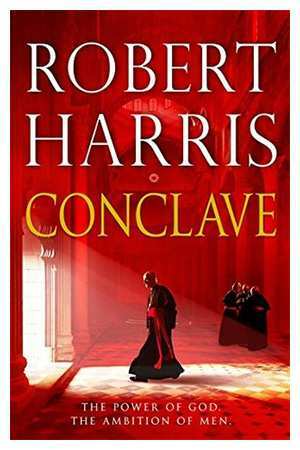 Conclave is the latest exciting historical thriller by Robert Harris. It features seventy-five year old Cardinal Jacopo Lomeli who has been contemplating retirement to peaceful meditation and study for several years, but the Pope insists that he still needs him at the Vatican. Lomeli feels he is a better manager than he is priest but this feels like a deviation from his real purpose. Can a manager truly be close to God? How much closer to God can he get than to be the Dean for the Pope? Suddenly though, the Pope dies. After the initial shock and more than a few prayers, Lomeli suddenly realizes, as the Dean, he is responsible for managing the conclave that will select the next Pope. God have mercy on his soul. So Behind the locked doors of the Sistine Chapel, one hundred and eighteen cardinals from all over the globe vote in the world’s most secretive election. They are holy men. But they have ambition. And they have rivals. Over the next seventy-two hours one of them will become the most powerful spiritual figure on earth. Lomeli doesn’t particularly want to be Pope, but he does have the name he would use selected if God does call him to serve. As much as Lomeli tells himself and others that he doesn’t want to be Pope, there is a small part of his heart that glows with the possibility. Managing a conclave proves a terrifying experience. The egos of the Cardinals arriving are so large that the room can barely contain the mass of their collective self-esteem. As we all know, they must be sequestered during the conclave to insure that no outside influence can be brought to bear on the process. However Despite all the precautions, there are always those who will go to great lengths to circumvent any system. Fervent disagreements arise early in the process as Cardinals jockey for votes, as piously as possible, thinly disguising their most vehement desires to be the most powerful spiritual leader on the planet. Lomeli is unnerved by the spectacle of so much naked aspirations, but at the same time, he is also trying to control his own ambitious pride. Then the unknown Cardinal Benitez shows up claiming that he received the red hat: ”In pectore (‘in the heart’) which is an ancient provision that allows a Pope to create a cardinal without revealing his name….” A Pope only does this if the Cardinal is working in an area hostile to Catholicism. Cardinal Benitez is a Filipino by birth but has worked in dangerous areas across Africa. He has the paperwork to prove that the recently departed Pope had named him the Cardinal of Baghdad. A series of votes follow without any conclusive result. There are four main contenders. However each of them has committed indiscretions which could stop them from becoming Pope. Then allegations are made concerning these indiscretions and Lomeli finds himself in the uncomfortable position of having to investigate them and it starts to look as if he is meticulously eliminating his competition to be Pope….